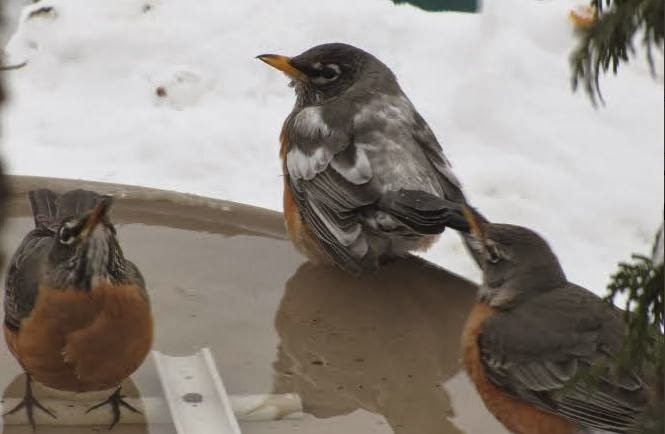 You might think it is an older fellow gone gray or a bird caught in an acid rain shower but he is actually a leucistic American Robin. Right now scientist describe two kinds of Leucistic birds, pale and pied. Pale leucistic birds will have the same markings, but are extremely pale. Pied Leucistic birds, like the one in your photo, have patches of white. Leucistic birds are relatively unusual but much more common than albino birds which are completely white with pink eyes, legs and bill. The bird is perfectly healthy but they may have it harder due to their different coloring and weakness in the feather structure. Predators may find them easier and mates may not find them acceptable at all. Thank you for sharing your photo with us! If anyone would like to share a photograph of nature send it to bloubird@gmail.com and I'll put it on the Friday Photo posts.